Between 1894 and 1927, Merrow Grange, near Guildford, was the home of Francis Baring-Gould, formerly a Director of the De Beers Diamond Mining Company, and Chairman of the Kimberley Central Company in South Africa. All but about eight acres of the estate were sold off for housing development during the 1930s, and Merrow Grange itself – together with its remaining gardens, was converted into an auxiliary hospital during the latter years of the Second World War. It was run as an independent girls’ school after the war, but the gardens were neglected, and became completely overgrown. A three-storey block of apartments with garages was built in this area of roughly 3.5 acres in 1985, and a major Pulham garden was rediscovered. The apartments are now called ‘Fairlawns’, and, fortunately, they were built with the stipulation that most of the listed Pulham features were to remain intact. Even better news is that some of the present owners have worked tirelessly since then to restore them, and ensure that they are maintained in as high a standard as possible. Its features include landscaped rock-lined paths leading to a large sunken fernery, approached on one side through a rock archway and small rock garden, and by a fascinating underground tunnel on the other. 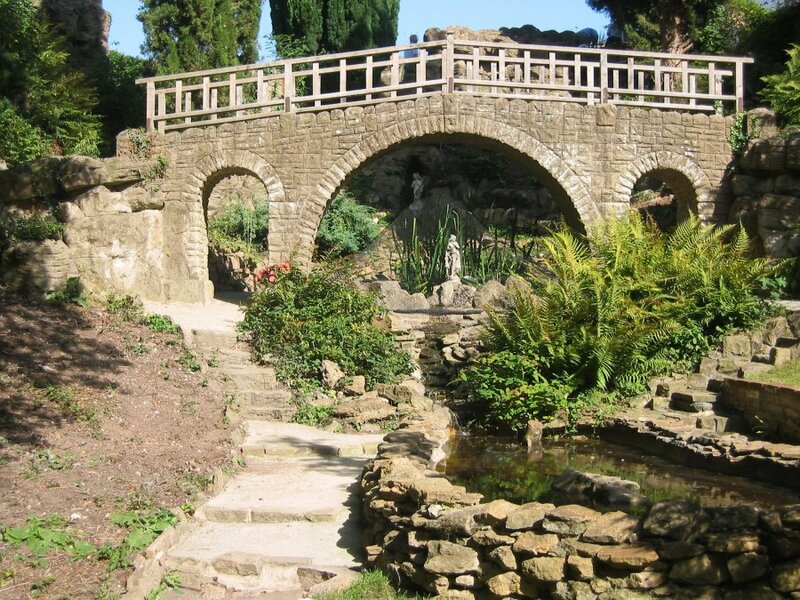 There is also a circular rocky pool and fountain; a large Pulhamite grotto with a sunbathing patio on top, and some balustrading that is listed in the Pulham Garden Ornament Catalogue as the ‘Merrow Balustrade’. There used to be a quarry in the grounds associated with one of the parcelled-off adjacent properties, and this was converted into a lovely Italianate-styled garden, with Pulhamite ‘screens’ around its rim to simulate a mountain range. It is known that James Pulham and Son were working on the rockwork and fernery between 1902-03, but the completion date is probably nearer 1907. A full description of the work done by James Pulham and Son at Merrow Grange – together with a number of pictures – can be found in Chapter 25 of Rock Landscapes: The Pulham Legacy – the critically-acclaimed and lavishly illustrated definitive story of the lives and work of James Pulham and Son. Written by Claude Hitching, with featured photography by Jenny Lilly. Published by Garden Art Press. Posted on October 1, 2014 June 27, 2016 by Claude HitchingPosted in Book ContentsTagged 'Fairlawns', . . James Pulham and Son, Claude Hitching, fernery, Francis Baring-Gould, grotto, Italianate Garden, merrow grange, pulhamite, Rock Landscapes: The Pulham Legacy, sunbathing patio.